Sometimes, you have to alter what you’re going to make for dinner when you find a good deal at the local grocery store. This is what happened to me yesterday… the store had some beautiful scallops and shrimp on a 50% off sale, so my recipe plan took on a life of its own. I started with two small packages (each) of scallops and shrimp. I shelled the shrimp, washed the seafood, and then seasoned everything with a dash of soy sauce, herbs de provence, salt, and freshly ground pepper, before letting it sit in the fridge for an hour or so. NOTE: This step isn’t necessarily important… I was bored and wanted to get dinner prep started early. Once I started cooking, I began by sauteing the seafood in some olive oil. Since I had so much seafood, I did this in two batches to keep the heat up. Once the seafood was cooked through, I removed it all and added a few cups of diced vegetables. I also added a healthy amount of Viognier white wine for flavor. NOTE: If I’d had it around, I would have used either James River Cellars Gewurztraminer or Vidal Blanc… either would be a great background taste for this stew. The vegetables were ones that I had picked up at the salad bar of the grocery store recently, so it was a great way to use up leftovers that needed to be eaten or tossed. While the vegetables were cooking, I decided to cook some pasta to throw into the stew, so I boiled some spaghetti noodles that I broke in half. I added the cooked spaghetti to the vegetables and then also added the seafood back into the stew. Once the components of the stew were together, I decided to play with the seasonings a bit. I used varying amounts of parmesan cheese, Viognier white wine, a little mozzarella cheese, and bumped up the tastes of the original spices. It was a fun dinner to create and delicious to eat… I added some garlic toasts and called it a night! Enjoy playing with your spices… they can make a huge difference in the flavor of your final product. Try one new spice at a time and see how it works with your meals and recipes. Have fun with your cooking… after all… it’s just food! 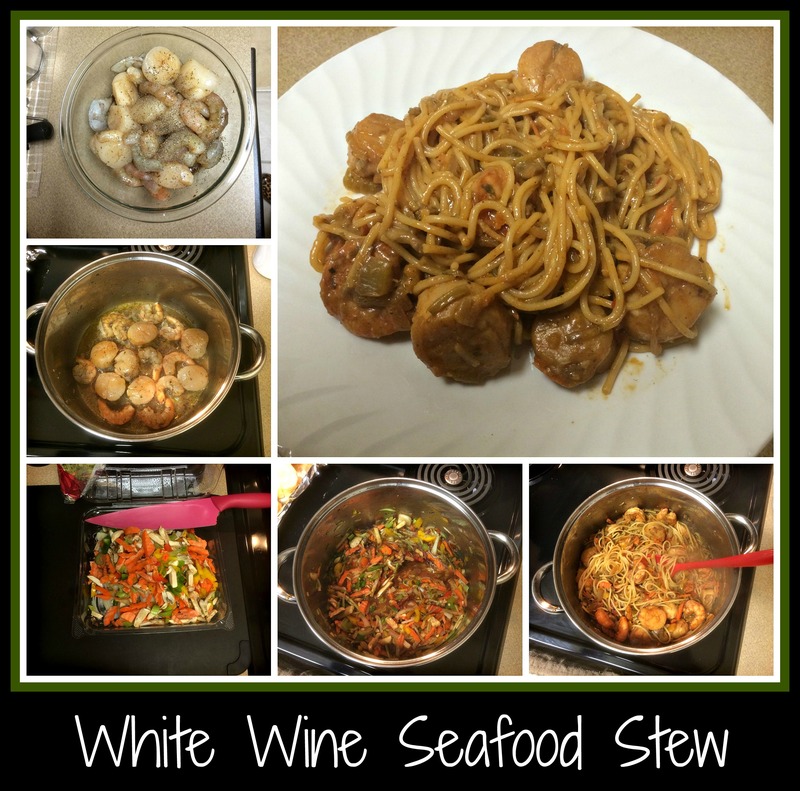 This entry was posted in Cooking, Recipe, Wine and tagged easy dinner, easy recipe, James River Cellars Gewurztraminer, James River Cellars Vidal Blanc, one pot dinner, pasta, scallops, seafood, shrimp, Vionier, white wine.